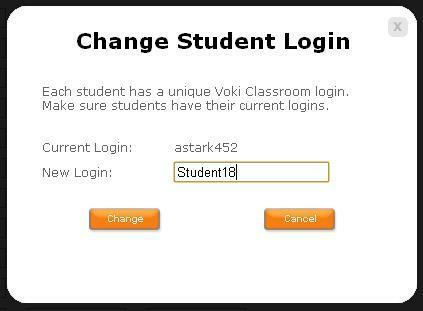 If you are a Voki Classroom user, you have probably already noticed the changes we implemented to make student logins much easier. Along with a simpler default username, Voki Classroom now allows you to edit your students’ login information as you or your school district deem most appropriate. The new student logins are comprised of the student’s first name initial, last name, and 3 randomly generated numbers. If you do not want your students’ last names to appear or you would like to change any aspect of the username, go to your student roster and click the name in blue to edit. Once you click the blue username, the ‘Change Student Login’ box will appear. The rest is up to you! Once you enter the new login, click ‘Change’ and you are finished! We hope you are pleased with this update. We are always eager to hear your your suggestions for Voki as we continue to improve your experience. Should you have any questions, please leave a comment below and we will be happy to answer you, or email us at feedback@voki.com.